Is it snowing in Valle Nevado ?¡Gracias! Mostly dry. Freeze-thaw conditions (max 4°C el sábado por la tarde, min 0°C el domingo por la noche). Wind will be generally light. Light rain (totál 2.0mm) at first, then becoming colder with a dusting of snow el jueves por la tarde. Temperatures will be slightly above freezing (max 3°C el miércoles por la noche, min 1°C el martes por la tarde). Wind will be generally light. La tabla anterior muestra el pronóstico de tiempo para Valle Nevado en la altitud específica de 3264 m. Nuestros modelos meteorológicos sofisticados permiten prever pronósticos para la cumbre, la mitad y la base de Valle Nevado. Para aceder a los pronósticos de tiempo a otras alturas, pinche en la navegación en la parte superior de la tabla. Para una visión general, consulte el Mapa meteorológico de Chile. My experience was as a skier who stayed in Santiago and went up on the moutains two days to Valle Nevado and others resorts nearby. If you are a tourist visiting Santiago and is curious to venture into a ski resort, you will love it! 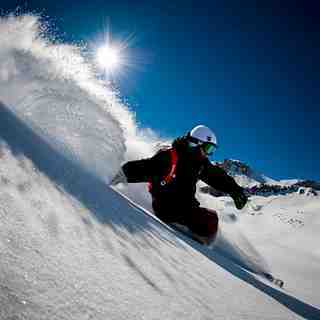 Otherwise, if you are a skier with some experience and seek a 'ski trip', think twice about choosing Valle Nevado. I always heard a lot about Valle Nevado and had to go skiing there. I have spent several seasons at other resorts in South America and the US and I can say that going back to Valle Nevado in the future will not be my first choice. Bariloche, even with poor snow, gives you a better experience. Valle Nevado resort has expensive hotels, few and expensive restaurants, only a refuge (restaurant in the middle of the slopes) and that is expensive, like 15 dollars a beer, 5 dollars a bottle of water and 25 bucks for a pizza. A robbery experience, even more knowing that in Santiago the price is 1/4 of that. The rental equipment is also restricted to just a store only, with high price, and an reasonable equipment. In addition, at 5pm everything is closed, including the only gift shop at the base of the parking lot (which also has no restaurant). If you are not staying at the resort hotel, forget the after-ski because you will have nothing. For those who do not want to stay at the resort and will stay in Santiago, the road is poor, with little maintenance; very tight. But worst of all is that it is traffic jammed for several hours. Incredibly they don't salting icy roads, even with snow forecast. The result is that when it snows, it forms a layer of ice for several kilometers, which causes a gigantic traffic jam for hours. In addition, there is a snow chain rental cartel at an absurd price. And even on hot sunny days, the police supervise and ask the 'possession' of snow chains. That is, you have to rent every single day that you plan to ski (average 25 Dollars per day) or buy (average 100 Dollars). What is incredible is a city like Santiago, with fantastic freeway roads (kilometer-long tunnels of 4 lanes to each side, subway, express avenues, v.g.) to cause jealousy in São Paulo, treat so badly thousands of tourists that go up to the mountains every day to the ski resorts. You will feel like being a hostage of a ridiculous road, with few and expensive transfers-van that have scheduled time, or of whom rents a car and falls in the rental market and 'placement' of snow chains. Unfortunate! The skiable area is good but you can do all the slopes in 3/4 of a day. It seemed to me that the ski area is similar to El Colorado, but the slopes at El Colorado have pleased me a little bit more. The off-piste area is great I could only enjoy it in one day because of the lack of snow, but this is not a resort guilty (ed: do you mean 'resort's problem? '), but the weather and nature. With more snow then the situation changes; the ski area is quite large. So overall, it was nice to visit Valle Nevado. Would I go back? Only if I fall with a parachute in Santiago for another reason. Would I plan another trip to Valle? Only if it did not have snow elsewhere in Argentinian resorts: mainly Bariloche or Ushuaia. I recommend that if you go skiing for more days, you should also visit La Parva and El Colorado located a bit closer (and slightly cheaper tickets). I also recommend that you rent a car and get off too early to get out of the traffic jam and pray that an old truck will not break in front of you and stand for hours.